Clean water is our state’s most important natural resource and Ohio’s farmers care deeply about protecting it. Ohio Farm Bureau’s Water Quality Action Plan is a series of proactive steps to improve and protect water quality. 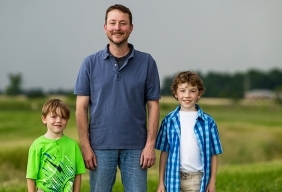 Ohio farmers are natural stewards of soil and water. We know we play a significant role in protecting Ohio’s water resources for Ohio’s families, schools, businesses and communities. 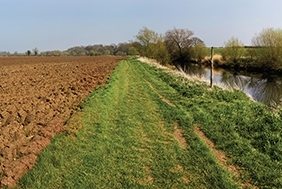 Because we take this responsibility seriously, Ohio Farm Bureau’s Water Quality Action Plan helps farmers proactively step-up their historic efforts to improve and protect water quality for the good of all. Ohio’s farmers will continue their commitment to serve on the front lines of maintaining safe and healthy water for our state. The effort is ongoing. In fact, no other state in the nation is doing as much as Ohio is doing. 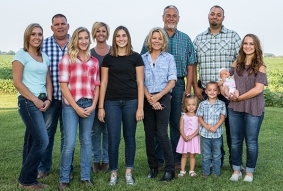 Along with Farm Bureau, many other Ohio farm organizations, agribusiness professionals and others from the farm community are working to meet your expectations. 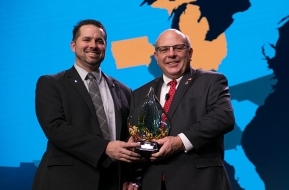 Ohio Farm Bureau has twice been recognized nationally for its water quality initiatives. In 2017, the organization's water quality grant program was honored with American Farm Bureau’s prestigious New Horizon Award, which recognizes new and innovative state Farm Bureau programs. And in January 2018, Ohio was again recognized with the New Horizon Award for work on the Blanchard River Demonstration Farms Network. "Ohio’s farmers are focused on two important goals - growing affordable food for everyone’s families and protecting the water of Ohio and Lake Erie." Fertilizer certification collaboration: To date, 17,493 farmers have taken one of about 200 classes offered through Ohio State University Extension. OFBF provided funding for the classes in counties that did not have Extension educators. Ohio Farm Bureau and partner organizations have invested more than $1 million in county water quality projects. 39 county Farm Bureaus have partnered with 130 groups on 43 local programs. 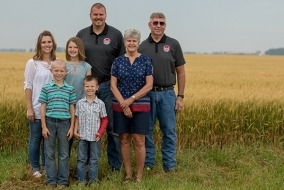 The Blanchard River Demonstration Farms Network's three farms showcase new and existing on-farm conservation practices that farmers can implement statewide to help improve water quality by keeping nutrients on the ground and out of waterways. 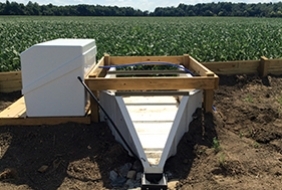 Right to left - Surface water flume for collecting samples for edge-of-field monitoring, Stateler Family Farms family, Kurt Farms family and Kellogg Farms family. ©2018 Ohio Farm Bureau Federation, Inc. All rights Reserved.